Images from two lesser known versions of Bhagavad-gita As It Is by His Divine Grace A.C. Bhaktivedanta Swami Srila Prabhupada. This is a small offering for the pleasure of the Vaisnava devotees. If we please the devotees it will please the Founder-Acharya of ISKCON, Srila Prabhupada, which will in turn please the previous acharyas and through the disciplic succession it will please the Supreme Personality of Godhead, Sri Krishna. That is my hope and desire. I beg forgiveness from all concerned for all my faults in making this attempt. This is not meant as a criticism of anyone. I am an ocean of faults and I have no right to criticize anyone. There is also no controversy here. This is not an all-inclusive scholarly presentation on all the Bhagavad-gitas published in English and other languages before Srila Prabhupada left us. It is not a commentary on book changes. It is only an unworthy effort to show the different paintings and photos and sometimes additional commentaries of those images which were used in these two different publications of Bhagavad-gita As It Is which are now practically non-existent. 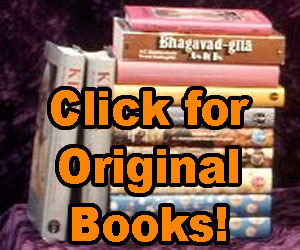 Srila Prabhupada’s disciples distributed these two books profusely during the 1970′s but today these two books can no longer be found except through the odd used book seller here and there on the Internet. Both books were printed during Srila Prabhupada’s manifest presence on this planet and therefore were produced before the many changes made to his books after his departure from this world. The original Macmillan version of Bhagavad-gita As It Is, with Sanskrit and word for word transliterations, was printed in 1972 and contained 47 color illustrations and one photo of Srila A.C. Bhaktivedanta Swami. That is a total of 48 color images. Both books shown here contain illustrations used in the original Macmillan Gita – with some additional paintings and a different photo of Srila Prabhupada added to one of these books – and many paintings from the original excluded and a different photo of Srila Prabhupada, plus one other photo and some paintings not in the original included in the other. The first book shown here is the Macmillan edition printed in the United States just after the original hard cover edition. This edition, printed with a golden yellow color cover with the original painting from the cover of the1972 edition, was published in two forms – hard cover and soft. There were 55 paintings and one photo for a total of 56 color images. The soft cover version is presented here. I received this version of the Bhagavad-gita As It Is, with no Sanskrit, numerous times before I moved into the temple at 340 West 55th Street in Manhattan in the late 1970′s. I eventually gave them all away to friends. I never received an original 1972 Sanskrit edition from any of the many devotees I met prior to surrendering to Lord Caitanya’s sankirtan movement. Perhaps, with this version having fewer pages and being much lighter, it was easier to carry more books to distribute while preaching. Or I was not ready to receive the more complete version. The second book shown here is the Cox & Wyman, Ltd., London, Reading and Fakenham version printed in Great Britain. The edition was first printed in 1975. The edition presented here is a fifth printing from 1978 but still copyrighted 1968, 1972 Bhaktivedanta Book Trust, and is softbound with no sanskrit. It has a blue cover with an updated painting of Krishna as the charioteer of Arjuna in the midst of the battlefield of Kurukshetra. Inside are 2 photos and 23 paintings with additional commentaries on each of the painting,s for a total of 25 illustrations. I have included only the photo of Srila Prabhupada and the eight additional color illustrations from the Macmillan soft cover Bhagavad-gita As It Is, which are not in the 1972 original. Anyone interested in comparing these with the 1972 original may do so at their leisure. I have included the two photos and almost all of the illustrations from the British version because they show the added commentaries on each painting. The two paintings I have excluded are in the 1972 original and have no added commentary. All the additional paintings in both books were done by ISKCON devotees and can also be found in other ISKCON publications of those times. Thanks for the memories! I have a copy in front of me of the yellow cover Bhagavad-gita, 1976 printing, which I’d given as a gift to my mother. Many British devotees will fondly remember the blue cover version, distributed profusely in the U.K. and elsewhere. In addition to Bhagavad-gita, there were several books printed in the UK at the time, including Perfection of Yoga.